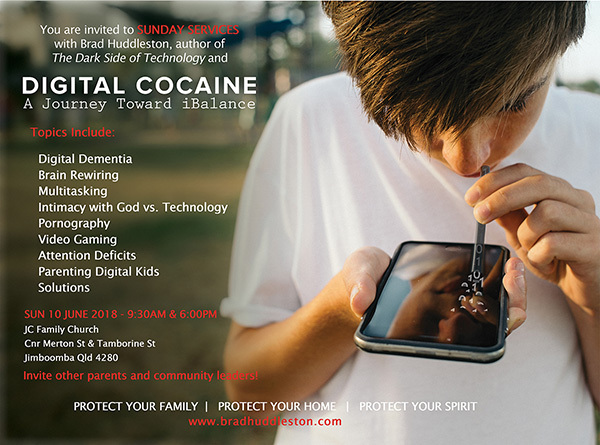 Brad Huddleston is an internationally respected speaker, consultant, teacher and author on the important issues such as technology and culture. He has worked with universities, schools, churches and law enforcement, and spoken to tens of thousands around the world on both the advantages of well-used technology tools and the dangers of the growing trend toward technology addiction. Brad has an on-going collaboration with the Bureau of Market Research (BMR) and its Neuroscience Division at the University of South Africa. Brad has a degree in Computer Science and a Diploma of Biblical Studies and is a credentialed minister in the Acts 2 Alliance (A2A) movement in Australia. He’s also a frequent guest on radio and television and author of Digital Cocaine: A Journey Toward iBalance and The Dark Side of Technology: Restoring Balance in the Digital Age. Brad and his wife, Beth, live in the beautiful Shenandoah Valley in Virginia (USA). What’s the difference between half a line of cocaine and an hour of playing a video game? Nothing, as far as your brain is concerned. What can you do to be effective at multitasking? Nothing, as far as your brain is concerned. What do digital devices in the classroom contribute to focus and concentration? Nothing, as far as your brain is concerned. Your smartphone, tablet and computer can be powerful tools to help you … or not. The choice is yours. Brad’s work gives you the power to make that choice. Join JC Family Church Sun 10 June at 9:30am and 6:00pm for this powerful message! !